Ian Mackay being brought aboard the Buckie lifeboat. 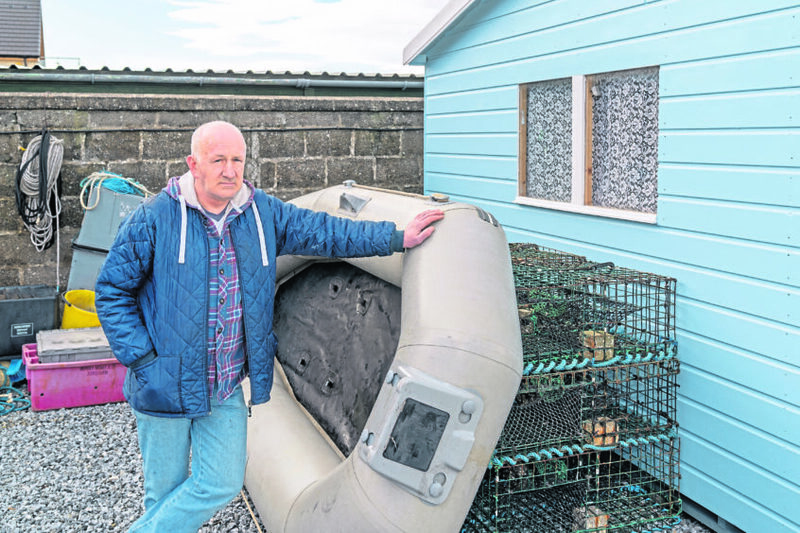 A hobby fisherman was told he is “lucky” to survive after his rubber dinghy capsized in the Moray Firth as he went to check on his creel pots. Ian Mackay ventured out into the choppy water on his dinghy yesterday morning, but was hit by a wave and ended up in the water without a life-jacket. With no radio, Mr Mackay desperately scrabbled onto the side of the dinghy and began trying to paddle to shore. A crane operator working near the coast spotted him frantically waving and raised the alarm, with the Buckie RNLI racing to his aid. Last night Mr Mackay, who lays creels near the coast as a hobby and keeps his dinghy in his back garden, thanked the lifeboat crews for saving his life. Ian Mackay said he would have drowned if the RNLI had not come to his aid after his rubber dinghy capsized in the Moray Firth. The Buckpool scaffolder said: “I tried paddling back to the shore but I wasn’t getting anywhere so I started waving my hands so that someone might see me. “I kept looking at the harbour and when I saw the lifeboat I knew I would be rescued. I would have drowned otherwise. 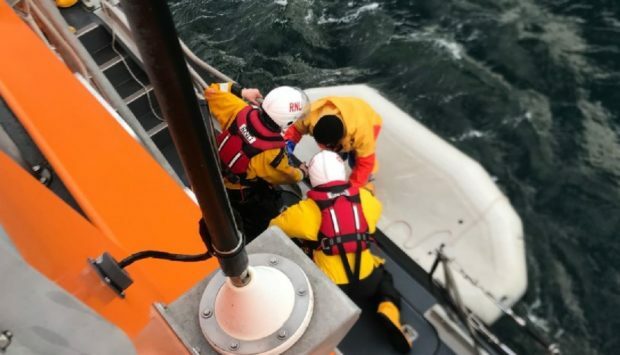 The incident prompted a stark reminder from the RNLI and coastguards that anybody taking to sea should carry a lifejacket, carry equipment to call for help and be aware of the weather. Mr Mackay’s craft capsized shortly after 11am after being caught side-on by a wave, overturning in the wind less than a mile from the shore. He believes he was in the water for about 10 minutes before he was plucked to safety. Ambulance crews were waiting to treat him when he was brought ashore at Buckie Harbour. Alan Robertson, coxswain of the Buckie lifeboat, said only luck had prevented the situation from taking a tragic turn. He said: “When we heard there was a person in the water we launched as fast as we could, in conditions like that you want to get to someone as quickly as possible because every second counts. “When we arrived on the scene we were relieved to find the casualty had managed to climb onto the top of his dinghy. A coastguard spokesman said: “Fortunately, the person was only slightly cold but it could have been much worse. We have to remind those who go to sea, that lifejackets are not optional, they need to be worn at all times – it’s useless unless worn.